If you’re a woman who loves being active in the great outdoors, you probably have your mother to thank, according to a new national study of women and the outdoors, with a timely message for Mother’s Day. Women who were “highly encouraged” by their mothers to play outside as young girls are more likely to remain active today, compared with those who were less encouraged, 86% vs. 78%. 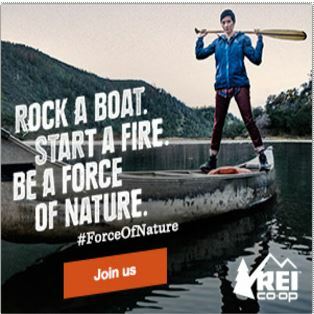 And they are more likely to consider being outdoors a “very high priority,” 26% vs. 11%, according to the nationally representative study of more than 2,000 women ages 18-35, commissioned by outdoor retailer REI. Yet at the same time, the study found 6 in 10 women say men’s interest in outdoor activities is taken more seriously than women’s, and 63% couldn’t name an outdoor female role model, even as 85% of them say the outdoors is good for overall health, happiness and well-being, and 70% find being outdoors is liberating. In honor of mothers and other women – whether grandmothers, daughters, spouses, aunts, sisters, cousins or friends – who’ve helped inspire a love for the great outdoors, here are some Mother’s Day gifts of Acadia and the outdoors, to thank them, and invite them to play outside with you. Senior Pass – If any women in your lives are 62 or older before Oct. 1, go with them to the nearest participating federal lands site that sells the lifetime Senior Pass for $10, before it’s slated to go up to $80. You can also buy the pass online for a processing fee, by uploading a copy of necessary proof of age and ID, but there’s a delay in delivery with the rush of people trying to buy before the price increase. The pass is good not only for Acadia and other National Parks, but also for all federal recreation lands, like national monuments, historic sites, wildlife refuges and national forests. The bearer of the Senior Pass can bring in a carload of passengers for free, or up to 3 other adults (children under 16 are free) at sites that charge per-person admission. Online weekly and annual Acadia pass – If the women in your lives are younger than 62, you can buy an annual or weekly pass to Acadia (or other National Parks) online as a gift instead. Every Kid in a Park Pass – If there’s a woman in your life who’s a mother of a fourth grader, you can help that fourth grader get a free Every Kid in a Park Pass online as a gift to Mom. Then the whole family can get in free to Acadia and all other federal recreational lands and waters this summer. Started under President Obama, this initiative aims to get kids (and their Moms) outdoors. Acadia Centennial gifts – Although the park’s Centennial was celebrated in 2016, it’s officially still Acadia’s 100th year until July 7 of this year. Some of the licensed Centennial gifts offered by Acadia Centennial Partners, including us, are still available. 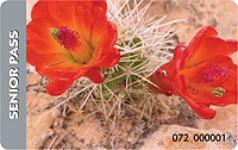 You can find out more at the Centennial Web site listing of products. And you can shop our Centennial products here, with at least 5% of gross proceeds still going to benefit the Friends of Acadia. 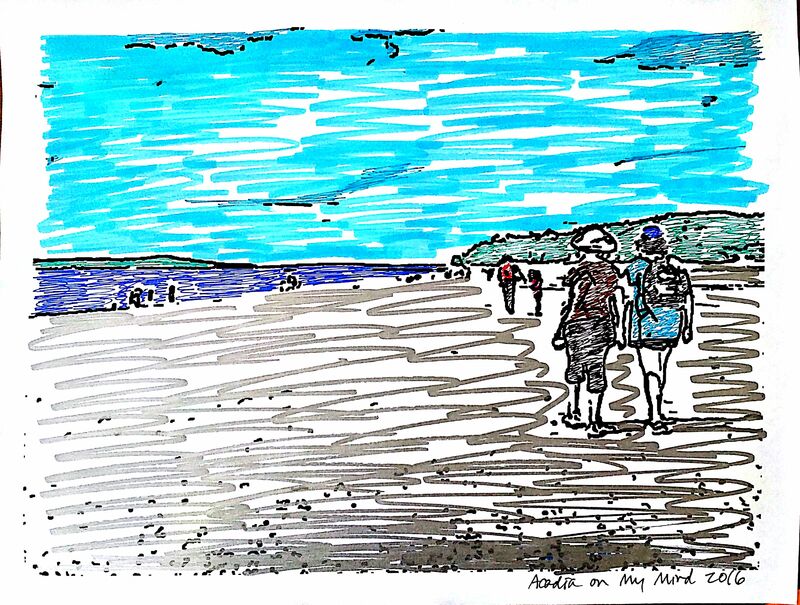 We turned an Acadia vacation photo with Mom into a fun family coloring page, using the technology of ReallyColor. 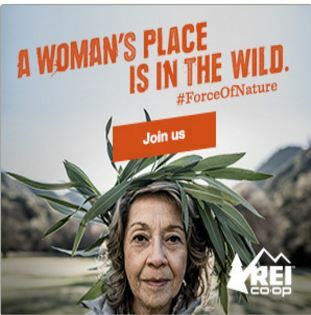 As part of its “Force of Nature” campaign for gender equity in the outdoors, REI is offering or supporting more than 1,000 events for women interested in the outdoors. Chimani mobile app and perks in Acadia and other National Parks – The free trip-planning app for Acadia and the 58 other National Parks now offers a $29 annual Chimani Perks membership, that provides up to $200 in discounts per park. For example, if you’re visiting Acadia, the new Perks program offers discounts at more than 20 area businesses, from bed and breakfasts to campgrounds, restaurants to outdoor activities. The app features GPS-enabled maps and information about hiking, camping, ranger events, museums, birding, boat launches, tides and a host of other categories. The membership and discounts could be a great Mother’s Day gift. 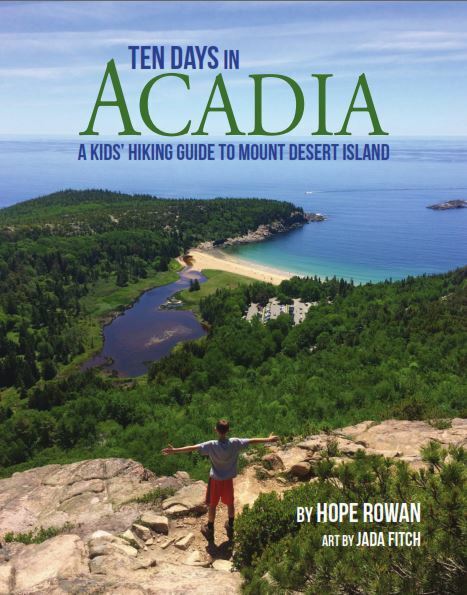 Whatever you do for Mother’s Day gifts of Acadia, perhaps the greatest gift of all: Spend time with your Mom outdoors, whether it’s a stroll around the neighborhood, a tour of a local garden, or a trip to Acadia. And whether or not you’re a Mom yourself, reach out to the girls and young women in your lives, and invite them on a hike along Acadia’s trails, or a bike ride on the carriage roads. Being active in the great outdoors is good for self-confidence, health and well-being, and the girls and young women in your lives will surely thank you one day.